Home / Contests • Featured / Contest Time! 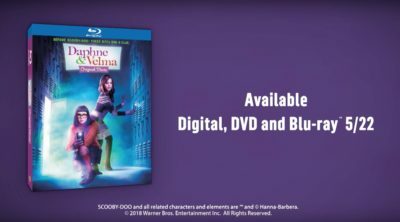 Win Daphne and Velma On Blu-ray! The Hilarious New Comedy Mystery Is Out May 22! Contest Time! Win Daphne and Velma On Blu-ray! The Hilarious New Comedy Mystery Is Out May 22! Okay, I have to admit, I really enjoyed watching the new Daphne and Velma movie! It’s a great look at how the two iconic characters from the Scooby franchise met. It’s adorable. I think you all will really like it, it’s a fun blend of nostalgia and tech. Jinkies! The smart and resourceful women of the iconic Scooby-Doo franchise, come to life in an all-new mystery with the release of Daphne & Velma from Warner Bros. Home Entertainment. The film stars Sarah Jeffery (Disney’s “Descendants: Wicked World”) and Sarah Gilman (ABC’s “Last Man Standing”), and follows the first mystery-solving adventures of Scooby-Doo’s leading ladies. Daphne and Velma, need your help! Use the embeddable Mystery Video Decryptor & Soundboard blog app to decrypt exclusive clips from the new hit film! Contest Time! Win Den Of Thieves On Blu-ray! The Riveting Thriller Is Out Now Starring Gerard Butler and Pablo Schreiber! I like the glitter slime as my niece would like this the best. The green one! Reminds of the one I played with back in the 70’s. Made by Mattel. I like the green slime because I had that kind years ago. Green seems like a natural color for slime. I like the orange slime the best because I like the color orange. Thanks for the giveaway! I like the orange glitter slime for Velma color because I like Velma the best and it reminds me of Fall and it’s one of our school’s colors. I like the orange glitter slime. I think I like it because I like the bright color of it and I am so tired of purplr with my daughter lol. I like the orange slime because I like the shiny bright orange color with the glitter. Also, I am tired of purple from my daughter lol. I like the green slime, because it is my son’s favorite color! The green slime is my favorite. I love the color. Like the green slime, it is the perfect color for slime. My favorite is the green slime because it’s my favorite color. Addendum: Purple glitter slime: because it’s so pretty! !